A bit of admin before we begin: I have FINALLY decided to set up a Facebook page which will be the best place to catch anything blog and Youtube related. After four years, I thought it was about time, so please go on over and like/follow to get more of an insight into my life! It's also important for all of those people who I have on my personal Facebook, it's time to give them a break from my blog related status'. See you there! My house group chat, is called The Princess Society. I don't know if I should admit that, is it a bit embarrassing? Regardless, it's the truth. But this blog post wasn't technically inspired by my daily messages from Aurora, Ariel, Mulan, Anna and Rapunzel, aka my five housemates, all in their twenties. It was inspired by the release of the live action Beauty and the Beast today. Because, despite my age, despite the fact I'm at university and have a lot to be doing with my day, including writing a 10,000 word dissertation... 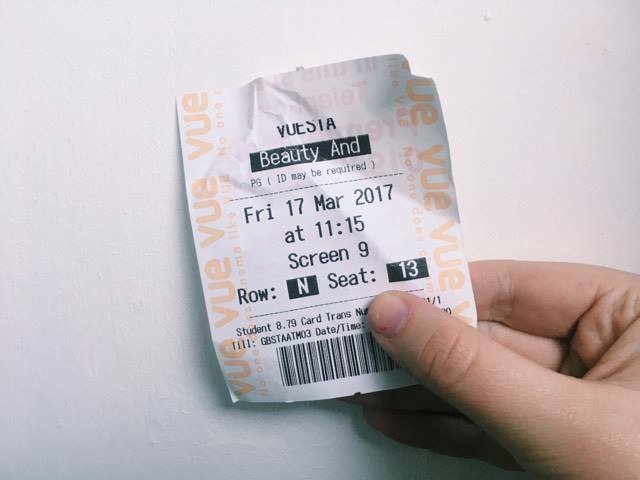 I spent last Friday (the release day) sat in the cinema, watching the 11am showing of Beauty and the Beast. And to me, that speaks a thousand words. The fact my friends and family are all buying tickets and asking me how it was, screams the impact of Disney on everyone's lives. For me, the timelessness of Disney is what keeps it magical. The original Beauty and the Beast came out before I was born and everyone has their own stories. Each film has a different meaning, a different memory, but nobody can claim it as their own. When I show my daughter the Disney films which have come out in my lifetime, she'll have her own reasons for wanting to be Mulan, or crying over Tarzan (that beginning though). There's a reason people flocked to the cinema to see Frozen and Moana. Disney is dependable, it's magical and it's home. Because of how much I love Disney (can't you tell), I entered the cinema half excited, half dreading the live action remake of Beauty and the Beast. Stupid, really, considering the Cinderella remake was my favourite film of 2014 and I vlogged the day I came out of the Jungle Book and swore it was a 10/10. But despite slightly wanting to find fault with Emma Watson as Belle - for no other reason that I want to be Belle myself - I couldn't fault the film. It's moving, it's magical and no surprises, I cried throughout. Also, for any Downton fans, Cousin Matthew (aka the Beast) grows a backbone and becomes a solid 10/10 in the process. Disney is timeless. It is a whirl of dresses and sword fights and magic spells. It's putting on a song and knowing everyone in the room will know the opening lines, it's dressing up as a five year old and not caring what gender or race you are, because in that moment, you are Cinderella. It's being twenty one and being Belle in your house Facebook group. And it's tearing up in the cinema when the overture to your favourite childhood film begins. If you couldn't tell, I basically just wanted to gush about how bloody great Beauty and the Beast is. NB: I don't feel like I can write a Disney blog post, without highlighting the revolting ideologies of Walt Disney, or the discrimination in the 20th Century Disney films. Littered with racism, misogyny and xenophobia, Walt Disney himself is not an idol, and the original films are inexcusably insulting. I will, in the future, elaborate on this, but it's important to me my readers do not think I am ignorant enough to be unaware of Disney's reputation. This blog post is written as a 21 year old high on the songs and films of my childhood.